The Lavender Festival is not until this weekend, but the Bulthuis ladies got a jumpstart on the botanical display. 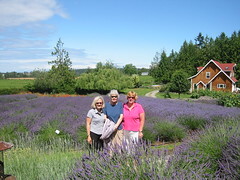 Sequim is a favorite day trip for us, and the lavender was an added incentive. I tagged along with the women to three different farms and we ate lunch at a church converted to deli. We redeemed the trip for me by stopping at the John Wayne Marina. I saw a Montgomery 17 and a Corsair 24! To each, his own: some like flowers and some like sailboats. What's this? A pun using the title of a Jimmi Hendrix song! Is this legal for someone from such a conservative town?